This is a set of 10 (ten) high-grade Prescott Plastics black oblong ribbed plugs. Our plugs work great for preventing scuffs on kitchen or wood floor or as protection glides on chair tips, bench feet, table legs, bar stool foot sliders, patio furniture inserts, and much more. They are also designed to hold up against impact abuse, and harsh weather conditions. 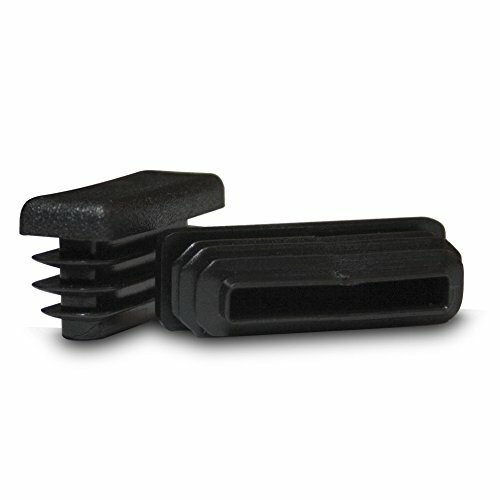 These easy to install 1.5x.5 inch rectangular plugs serve as a long-lasting solution for many household or outdoor projects including replacements for fencing railing posts, gate rail post covers, trailer frame ends, pole pipe rod caps, metal bike rack fittings, wrought iron steel finishing plugs, or any rectanlge opening. If you have any questions about this product by Prescott Plastics, contact us by completing and submitting the form below. If you are looking for a specif part number, please include it with your message.